Here is a look at the 19 players advancing to Day 2 in the money from Flight B of the $600 No-Limit Hold'em Multi Flight Re-Entry event. These 19 will join with the 14 from Flight A, along with any that bag in Flights C and D to play Day 2. Day 2 play will begin at 12:00 noon on Tuesday May 9th. Aaron Smith just sent a player home when he got it all holding pocket kings against his opponent's pocket nines. The board ran out J♥J♠6♠K♣Q♥, awarding Smith the pot, and eliminating his opponent in 21st place. There are now 20 players remaining, with 19 of them making the money. 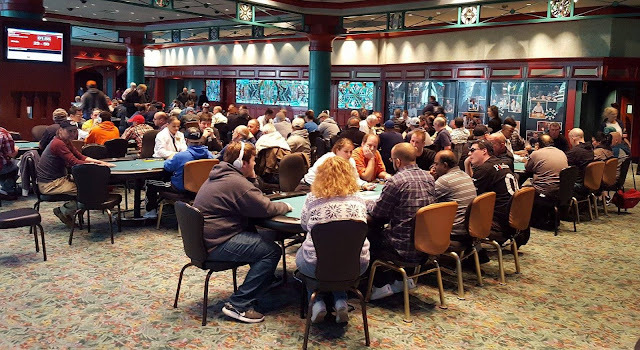 They are now playing hand for hand until the money bubble breaks, at which point the remaining players will bag up their chips, and return to play Day 2 on Tuesday May 9th at noon. This is a best stack forward event, so any player that bags more than once will be compensated $1,200 for each additional stack bagged, and carry forward only their largest stack to day Day 2. There were a total of 269 entries in today's $250 No-Limit Hold'em Super Stack Turbo event, generating a prizepool of $56,100. The top 36 places will make the money, with first place taking home $12,864. There were a total of 154 entries in the second flight of the $600 No-Limit Hold'em Re-Entry Event #1. The field will play down to the final 19 players before bagging and tagging later tonight. Those 19 players will join the 14 players that advanced in yesterday's Flight A, along with any that advance in Flights C and D, to play Day 2 on Tuesday May 9th at 12:00pm. All players that make Day 2 will return in the money, and any player that bags in multiple flights will take home $1,200 for each additional stack they bag, with only their largest stack advancing to Day 2. The final 34 players in Flight B of Event #1 are now on a 60 minute dinner break. They will return to play Level 14 with 1,000/2,000 blinds, and a 300 ante. Players are taking their seats for the start of Event #2, the $250 No-Limit Hold'em Super Stack Turbo event. Registration is open until the start of Level 11, and re-entries are allowed until reg closes, around 7:45pm. There's around 13,000 in the middle, and the board reads 10♥9♥2♠. The player on the button moves all in for around 18,000, and Dan Chalifour quickly calls from under the gun, having the player covered. The 8♦ comes on the turn, giving Chalifour a gutshot straight draw, but leaving his opponent in the lead with his set of twos. Unfortunately for the player, the J♣ on the river brings the straight for Charlifour to win the hand, and the player is eliminated. "Why can't I just win one time when I get it in so far ahead?" the player says as he stands up from the table and walks away. Yesterday's Flight A saw a total of 110 entries. They played down to the final 12% of the field, leaving the final 14 players in the money, when they bagged up at the end of the night. Flight A ended late Friday night/early Saturday morning in the midst of Level 20 (4,000/8,000 blinds and a 1,000 ante). We are currently in the midst of Flight B, and a new post with notable chip counts will be posted momentarily.